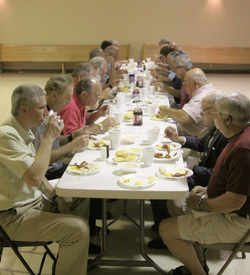 On the Fourth Sunday of every month, the men of the church are invited to take part in the Men's Breakfast. At the breakfast, there is a brief bit a business, prayer, and a speaker. The breakfast is a full southern breakfast with eggs, bacon, ham, grits, biscuits and more. A voluntary donation is taken up to offset the cost of food and paper products.